100% Raw Organic Cold-Pressed Argan Oil. Argan oil is a plant oil produced from the kernels of the argan tree. It contains Vitamin E and fatty acids which are beneficial for skin, nail and hair. Great moisturizer and anti aging product. 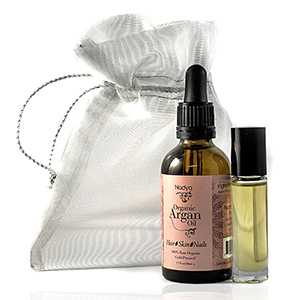 Kit Includes: 1.7oz Argan Oil Bottle, 1/3oz Roll On Bottle and Gift Bag. Suggested Use: Apply a small amount directly to hair, skin or nails for best results. Nadya's Use: In Addition to using my product directly, I add a few drops to some of my favorite hair, skin and nail products for optimal effects. FOR HAIR: Apply a small amount on your hair 15-20 min before washing your hair. For deep treatment, leave it over night. Store in a dark cool area to keep fresh. If you have dull, dry hair, or you just need extra moisture, there are many products on the market that can help you in your quest for shiny, hydrated hair. Essential oils like Jojoba, Hemp, Macadamia and Argan are infused in many natural hair products. These essential oils can be found in moisturizing shampoos, conditioners, and masks. These naturally-occurring oils are gentle enough for color-treated hair, but will give your hair a deep conditioning effect every time you use them. There are other benefits to using essential oils, as well. The oils can help calm down irritation from a sensitive scalp. They also help moisturize a dry scalp, protect against split ends, and help volumize thin, limp hair. Earthly Body infuses both Hemp and Argan oils into their shampoo and conditioner to smooth, condition, and control hair, while moisturizing even the driest of hair. Whether or not you have chemically or color-treated your hair, Earthly Body Marrakesh shampoo and conditioner will restore moisture to even the driest of hair. For extra moisture, use a hair mask like the Palvin Mask Deep Conditioner and Reconstructor. This mask is a deep penetrating conditioner that helps reconstruct dry, damaged, weak hair. It includes silicone oil that rebuilds the hair follicle, infusing it with extra volume and shine. The Silicone oil it includes rebuilds damaged hair quickly, and restores your hair’s natural vitality and beauty. For the best hydration and moisture, essential oils are key nutrients to restore your hair. Essential oils like Jojoba, Hemp, Macadamia, and Argan will help calm and moisturize a dry or sensitive scalp, protect against split ends, and deeply moisturize and condition your hair from the inside out.